Buying an engagement ring online can remove some of the pressure of shopping in a brick-and mortar store, but it also presents unique challenges. You can’t touch or personally examine an engagement ring through your laptop or smartphone, which makes buying from a reputable website extremely important. Knowing what you’re looking for is also crucial. 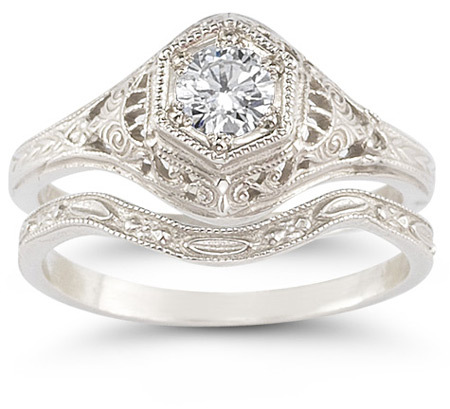 One of the advantages to buying an engagement ring online is the vast array of styles you can peruse in your pajamas. Within an hour you could view thousands of rings, and while this can increase the chances that you’ll find exactly what you’re looking for, it can also be rather overwhelming if you haven’t narrowed down your options. Most websites allow you to search by a number of variables, including type of metal and price. To use these search features to your advantage, you first need to have some idea of what type of ring you’d like to buy. Does she prefer classic looks or more modern designs in jewelry? Does she prefer white gold or yellow gold? Does she gravitate toward delicate, feminine styles or bigger, bolder looks? Has she talked about any styles she likes or doesn’t like? If you don’t know her ring size, find out what it is to avoid purchasing a ring that’s too big or (even more awkward) one that doesn’t fit on her finger. A closer friend or family member may be able to help you so you don’t tip her off that you’re getting ready to pop the question. 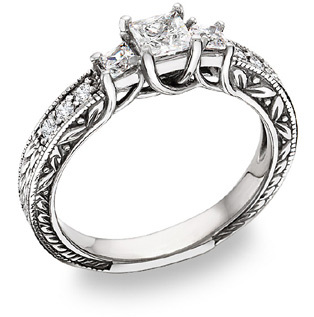 Quality is an extremely important factor in buying an engagement ring online. Look for pieces that are made from only the highest quality materials using the finest craftsmanship—an engagement ring is meant to last a lifetime and it’s important to choose one that will retain its beauty for decades to come. Purchasing from a reputable jeweler such as Apples of Gold (applesofgold.com) is a good way to ensure that you’re getting a ring with exceptional quality and beauty. Since you won’t be able to see the ring in person until after you’ve purchased it, be sure to clarify a jeweler’s return policy and any warranties that they offer. When buying an engagement ring online, be sure to order in advance if you’d like to propose on a certain day. If you’re getting a custom-made ring, you’ll likely need to wait a little longer, just as you would if you ordered a custom ring at a brick-and-mortar jeweler. Shopping for and buying an engagement ring online can be a fantastic way to find the perfect ring without running from store to store. By knowing what you’re looking for and seeking out a quality piece, you can find an engagement ring that will sweep her off her feet. « What is a Promise Ring?